Kvar el la 14 fringospecioj trovitaj en Galapagoj, ŝajne evoluis per adapta radiado kiu diversigis ties bekoformojn por adapti ilin al diferencaj manĝoresursoj. ↑ LARSEN, Clark S.. (2011) Our Origins: Discovering Physical Anthropology, 2‑a eldono, Norton. ↑ 2,0 2,1 SCHLUTER, Dolph. 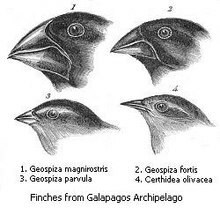 (2000) The Ecology of Adaptive Radiation. Oxford University Press, p. 10–11. ISBN 0-19-850523-X. ↑ LEWIN, Roger. (2005) Human evolution : an illustrated introduction, 5‑a eldono. ISBN 1-4051-0378-7. Ĉi tiu paĝo estis lastafoje redaktita je 22:27, 5 aŭg. 2013.